I buy my pet food online now. I love that service. Shaving products? You betcha’. Books? Absolutely, of course, and all the time. When December rolls around, I stay far away from malls and let my fingers do the shopping. I could go on. I’m an online shopper of the highest order. Are you? If you’re not, though you may not have come around to examine your reasons, I suspect you’re not 100 percent trustworthy of the process or your ability to pull the trigger on the right product. And if you are? You’re probably finding all the “safety signals” you seek. You’re doing business with companies you trust. Why would that be? In my mind, it’s a fascinating question that led to an insightful conversation with Tomer Tagrin, co-founder and CEO of Yotpo, who’s become a prominent voice of authority on the subject of e-commerce. If you want to do business with online shoppers, this is must-see video. Below, you’ll find the highlights of my conversation with Tomer. Barry: I get my pet food, razors, and much more via e-commerce sites, but for so many shoppers, there’s still a lot of trepidation about the model. 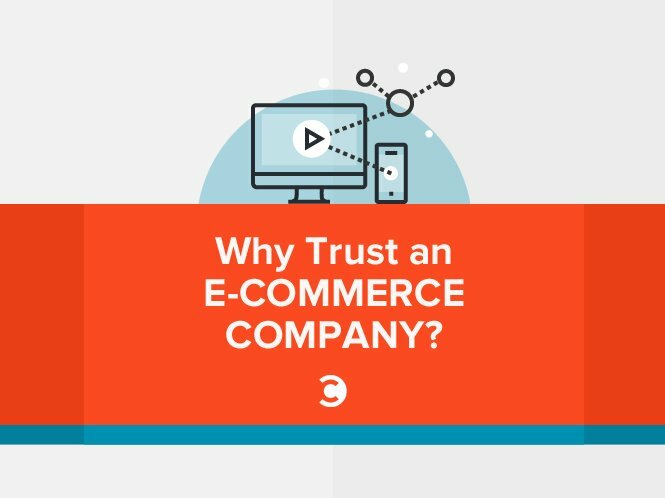 It’s not easy to go shopping online and put complete trust in the seller, is it? Tomer: The marketers of e-commerce websites have two very problematic trends ahead of them. One is ad tech—online advertising. Google and Facebook dominate the entire ad spend. PPC prices went up, tremendously up. And it’s very, very hard how to prove any kind of ROI. In order to deal with that, a lot of the gurus of the world tell us, hey, you should also use content marketing. You should generate your own content. Make it very high quality, and distribute it to your customers. The problem with e-commerce and content marketing is that it doesn’t work. Why? Because, one, it’s not scalable. I cannot write 100 blog posts, 50 videos, and 40 infographics on a monthly basis. It’s super expensive to do at scale. And the second problem is consumers do not believe what companies are saying today. There is a massive authenticity problem. The other trend we are seeing that is quite interesting—and both positive and negative—is the emergence of consumer platforms. If you think about the marketer, back in the day, they had their own website, maybe they did some Google stuff, SEO, SEM. Now all of sudden you have Facebook, Twitter, Pinterest, Instagram, Snapchat, messaging, email marketing, and who the hell knows what’s going to be in the three years? The emergence of consumer platforms basically means your potential customers are everywhere, and so you need to be everywhere. You need to market everywhere. That’s super demanding from a budget standpoint, from an attention standpoint, and from a team-building standpoint. Those two trends present a massive challenge and opportunity for the marketer. That’s why we’re excited about e-commerce. It’s evolving and creates new challenges and new opportunities. But being a VP of marketing, a CMO, or a director of marketing today at an e-commerce company is a hell of challenging job. Barry: Given all those challenges, the low level of customer trust, and the difficulty of scaling your content, what’s a poor e-commerce company to do? Tomer: I’m an entrepreneur, so for me problems and challenges are an opportunity. So actually, I like to be in an environment that is not easy. I think we need to do a few things. One is get back to the basics. So many things are going to change in the next ten years in terms of marketing, but I want to talk about the things that won’t change and haven’t changed for the last 20 years. The stuff that’s not going to change is, one, human beings trust other human beings. That’s super important. People trust other people more than anything else and want to buy from people. In the offline world, when I’m going to my favorite local store, I trust the seller that I’m meeting in the shop to tell me what he thinks is going to be the right fit for me, or what she thinks I like, because they know me. Also, I want to see what other people that bought the product are saying about it. We need to take this to the online world. So that’s one thing: getting back to the basics. If you look at one massive trend that’s happening, it’s that Amazon is one of the most successful companies that was founded on the notion of user-generated reviews and the community. Then you have companies in travel, like TripAdvisor or Booking.com, that completely dominate the travel industry mainly because of user-generated content (UGC). You have employment companies like Glassdoor that are doing phenomenally well, again because of user-generated content. I think businesses should look at this trend and what the most successful consumer companies are doing. They are making long-term investments in their customers and in gaining the customer’s confidence. And that’s what we recommend companies do: (a) Listen to your customers and build great products and great experiences, and (b) generate content from your customers and make sure the content is everywhere. You should start marketing your product and business, but include what relevant customers are saying about your product, your services, and your brand. That starts with reviews and includes Q&A, videos, photos—and soon it’s going to be VR and AR. No matter what the medium is going to be, one thing that is not going to change is, again, people need to trust your brand. People need to trust your product. And the best way of doing that is through other people. Barry: Let’s talk about social media. It evolves quickly before our eyes every day. HubSpot recently did an interesting list post, and on that list, number three was this idea that social media is becoming an “avenue for sales.” Is that accidental? I mean people don’t go, “Oh, I’ll go shopping on Twitter,” but indeed most of the points made perfect sense. Tomer: An interesting trend we’re seeing is that companies like Facebook, Instagram, and Pinterest are moving more and more towards the e-commerce experience and want the shopping experience to happen via their channel. I don’t think people are saying, “I want to go Twitter to buy something,” but actually social media has been a medium for discovery, to discover products. Meaning, I am already on social media. Hey, I’m seeing those good products, and if I can buy at the same time I’m seeing it, that could be a super interesting and powerful experience. When I know what I want to buy, I will probably go to Amazon or to your website to buy it. But if I don’t know and I’m just in a discovery mode, that can be a super interesting experience. Now, that again means that if you look at those social media, those are by nature user-generated content platforms. And that means in order to do a good job in selling on Instagram, Pinterest, Twitter, Facebook, or Snapchat, you’ve got to make sure the user-generated content that is generated around your brand and from your brand and from your customers serves the purpose of converting customers. The only way for you to build a phenomenal brand is to actually take advantage of those opportunities. But that means you need to do a good job everywhere. And the only way to achieve that is to rely on people that are everywhere. You can’t build a 200 people team. So you’ve got to magnify yourself through your customers. Where Does UGC Fit in the Funnel? Where do you think that fits into the funnel? A second ago we were talking about social media and you introduced that as “discoverability,” but that moves me further down the funnel. Does user-generated content actually apply at all levels? Tomer: At Yotpo, we think a lot about where user-generated content fits. So in the beginning, like everybody knows, with reviews, it was mainly a tool for conversion. I’m getting on a product page, I’m getting on a landing page, You want to convert me? Put up relevant reviews, and you’ll convert. What we learned though, is super-interesting. Through our partnerships with the Facebooks, the Googles, the Twitter, the Instagram, the Pinterests of the world, is user-generated content can actually be used in the acquisition phase higher up the funnel. And I can tell you one of the things that excites us the most is also how can you use user-generated content as a retention tool. Our belief is the brands that are going to really succeed are going to use their user-generated content in acquiring customers, converting customers, retaining customers, and also understanding customers. The best brands in the world are actually doing a phenomenal job with all that. Barry: I love that. Especially the idea of retention, because a customer that sticks around and buys regularly is obviously worth a lot more. So we’re talking about increasing the lifetime value of the customer, aren’t we? Tomer: Yes. Again, one trend that you see is all the subscription-based e-commerce—trying to have a recurrent experience on the website. In B2B, marketers understood very, very fast we shouldn’t look at winning customers as a one-time thing. If you have something that is recurrent (like SaaS), you have repeat customers. You shouldn’t look at it like, “What’s the order value of the customer,” but you should look at it as a customer lifetime value. What’s the worth of the customer through their entire lifetime? So, as an example, if a customer pays me $10 a year, but every year they buy at my website for an average of four years, the customer is actually worth $40 and not $10. I think as time goes by, we’ll see e-commerce companies starting to understand that, because acquisition and conversion is so hard. Once you’re able to convert, you should put a lot of resources into retention and actually increase the customer lifetime value, and not necessarily increase the amount of customers that you have. That’s another great way to increase your company’s revenues.